Technology for disposing of human waster hasn’t changed a whole lot since the invention of the flush toilet in the 16th century. These days, you push a handle or button, and water whisks waste away to either a septic system or a sewage treatment plant. Problem is, this system doesn’t work so well for the 2.5 billion people who lack access to running water. This led the Bill and Melinda Gates Foundation to finance a competition to “reinvent” the toilet. It’s looking for a loo that’s inexpensive to operate, off the grid, and able to zap the germs that can lead to cholera, dysentery, and other diseases that plague the world’s poor. Here’s the inventive winner–and a simpler, cheaper rival. California Institute of Technology environmental science professor Michael Hoffman led a team that came up with a self-contained sanitation system, in which solar cells A power an electrochemical reactor B that converts liquid and solid waste into fertilizer and hydrogen. The hydrogen is stored in fuel cells C as energy, while treated wastewater D is reused to flush the toilet or to irrigate crops. Drawbacks: It is complicated, requires highly trained maintenance workers, and costs up to $2,000 per potty. While the Caltech toilet is being field-tested in India, some very low-tech composting toilets are already in use, like the model developed by Sustainable Organic Integrated Livelihoods (oursoil.org) for use in Haiti. A funnel arrangement diverts urine into a receptacle for local disposal, which reduces odor and lessens the burden of transporting feces to a composting facility, where six months of treatment transforms the waste into fertilizer. (Toilet users begin that process with a handful of sugarcane bagasse or sawdust, which also deters odors and flies.) These toilets can be made for about $50 from local materials. There is one high-tech element to the process: a cheap, portable DNA testing kit developed by the Lawrence Berkeley National Laboratory to confirm the absence of harmful pathogens in the finished product. 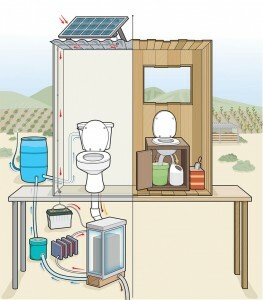 No Replies to "Sierra Magazine: Innovate: Off-Grid Toilets"